What to wear? What to wear? I’ve been packing a suitcase for nearly a week, which makes me well qualified to speak on the topic of how not to pack for travel. Today marks my fourth round of taking everything out of one suitcase, hanging one or two items of clothing back in the closest, removing one or two new things from said closet and repacking. I should mention that while I’m still repeating this shuffle, it’s not with the same suitcase I started with. Ah, I loved that first suitcase I packed, compact, easy to wheel around, seemingly roomy enough for everything, and best of all, purple. After four days tucking, squeezing, and flattening my clothing with my hands, followed by jumping up and down to close that purple beauty, I transferred everything to suitcase two. Why is it so hard to decide what to put in a suitcase? Our more recent trips have taken place in cool climates among cultures that value the outdoors life. These lend themselves to easy packing decisions: one pair of clean jeans per week, a few sweaters, a coat and an umbrella. Our upcoming destinations start hot and dry and end cold and wet, which makes planning more difficult. But I can’t blame my indecision entirely on the change in climates. I hold up this blouse to these pants, these pants to those shoes and this tank top to that pair of shorts and ask myself, will I be pegged immediately as coming from the U.S.? The answer is almost always yes. I remind myself that these days clothing may not distinguish one traveler from another throughout much of the world. Who doesn’t wear jeans? Maybe what’s more worthy of examining than whether my fashion sense matches anyone else’s is what our other suitcase contents say about us, either when we’re leaving home or returning. 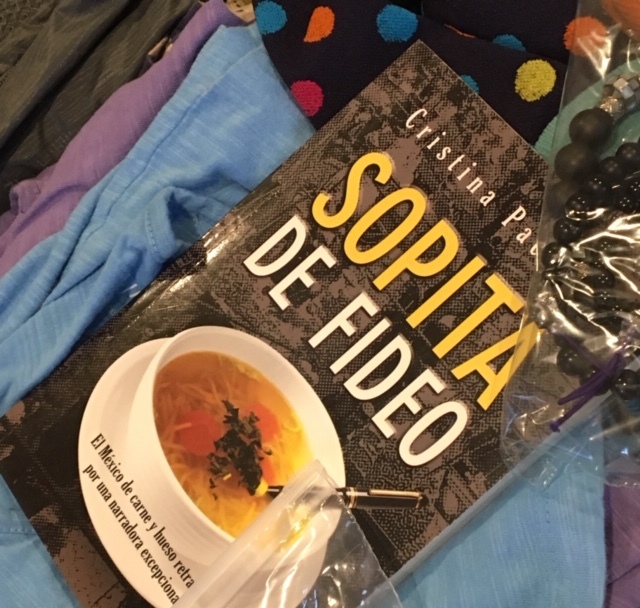 For example, I’m taking a Spanish language book to Spain, where you’d think I might happen upon something to read in that language. Last year, my husband and I bought brown Norwegian goat cheese (gjetost) to bring home, only to find it in our local grocery store. What I should remember when I’m packing is that the world is smaller than we realize, and I am bound to blend in with at least a few of the 11 million tourists who visit Andalusia each year or the 17 million who go to Amsterdam. And, hey, if I’m too cold in Amsterdam, I’ll take a wild guess that they sell sweaters there. This entry was posted in personal reflections, travel and tagged packing, standing out in another country, travel, what to take when you travel, what to wear. Bookmark the permalink. You are correct! And if you leave space and then need to buy a sweater or some other garment, you have an automatic souvenir of the places you visited! I sometimes set out with that goal in mind!